The Neiman Dermatology Building offers a full range of cosmetic services for every beauty need! The staff is extremely nice. The facility was so beautiful, I felt like I was on Park Avenue. I cannot say enough for all Neiman Dermatology has done for me. From treating my adult acne to developing a skin care program that will keep my skin beautiful and healthy, I'm very pleased with the 'new me'. The Neiman Dermatology Building provides excellent care and outstanding results. Call us for your cosmetic dermatology needs! Dysport® is a prescription injection to help smooth the appearance of moderate to severe frown lines between the eyebrows without changing the look or movement of the rest of your face. Restylane® LYFT, formerly known as Perlane, is an injectable gel filler that increases volume and smooths wrinkles. In the latest clinical trials, 95% of patients reported improvement with regard to the appearance of their midface area at 2 months post-treatment. Restylane® DEFYNE is a cosmetic filler that provides smooth, flexible, natural-looking results with increased flexibility. Restylane® DEFYNE is formulated to fill in mild-to-moderate nasolabial folds and marionette lines. Botox® Cosmetic is the most popular cosmetic procedure in the country and one of our most requested services. Quick, safe and effective, Botox® Cosmetic reduces or eliminates facial lines and wrinkles for up to six months with no downtime and little to no discomfort. The best candidates for Botox® Cosmetic are men and women seeking an enhanced appearance with fewer wrinkles. In addition, it is important that those seeking treatment are in good physical health, are not pregnant or nursing, and do not have a neuromuscular disorder. People seeking Botox® Cosmetic injections should have realistic expectations regarding this procedure's abilities and should discuss their desired goals with Dr. Neiman beforehand. 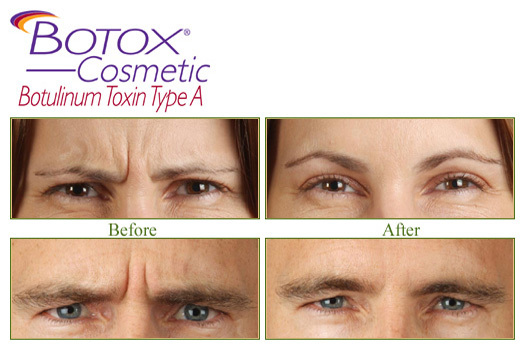 Through a series of tiny injections, Botox® Cosmetic gives you a rejuvenated look by smoothing crow's feet beneath the eyes, frown lines between the eyebrows, horizontal lines across the forehead, worry lines around the mouth, and lines on the neck. The procedure only takes a few minutes and requires no anesthetic. Results appear within 24 hours and typically last four months or longer. Juvéderm® is an injectable smooth gel filler that adds volume to different areas of the face to lift cheeks, smooth parentheses lines, or plump the lips. With just one treatment, you'll get smooth and natural-looking results that last up to a year. The substance is largely hyaluronic acid, a substance normally found in the skin, muscles, and tendons of mammals. Juvéderm® is manufactured using Hylacross™ technology, creating a smooth-consistency gel. It is infused with lidocaine to improve comfort during treatment. With Juvéderm® you get the smooth results you expect, with the improved comfort you want.Everyone will notice, but no one will know. Everyone’s skin ages differently and Juvéderm® may be used to rejuvenate multiple problem areas. From smile lines to vertical lip lines, you can smooth away unwanted wrinkles and restore natural contours. Microdermabrasion is a minimally invasive spa procedure that rejuvenates the appearance of the skin by treating sun damage, scarring, wrinkles and other unwanted skin problems. The MegaPeel™ microdermabrasion system uses a gentle stream of tiny crystals to exfoliate the outer layer of the skin and produce fresher, younger-looking skin and a renewed appearance. It has been performed safely and successfully in the US since 1996. During the MegaPeel procedure, the device wand will be moved gently across the targeted area to abrade the dead skin cells with minimal irritation. When performed in conjunction with a personalized skin care regimen, patients can achieve smoother skin, improved circulation, a more balanced skin tone and a reduced appearance of deep wrinkles and scarring. This treatment is administered as a series of six 45-minute treatment sessions performed every one to two weeks. Patients may experience redness, irritation and flaking after each session, but can return to work and other regular activities as soon as desired. The results of this procedure will appear gradually, with full results developing after two to six months. The Rejuvapen micro-needling device utilizes micro needles. As a result, your skin becomes firmer and regains elasticity, fine lines and wrinkles are visibly reduced, pores become finer, circulation is stimulated and the overall condition of the skin improves. Rejuvapen treats fine lines and wrinkles, acne scarring, surgical scarring, burns, stretch marks, and firms and tightens most body areas, and can work together with your current skin care regimen. Using advanced pulsed light technology, the non-invasive LightSheer® DUET™ Laser Hair Removal System swiftly and painlessly removes hair of all colors from any area of the body, including the face (chin, upper lip, cheeks, nose, or ears), legs, arms, underarms, back, chest, or bikini line. In a series of ten- to 30-minute sessions, the skin is coated with a cool gel before the LightSheer hand-held treatment unit is touched to it. Pulses of light loosen hairs from their follicles beneath the skin's surface. Patients report each laser pulse feeling similar to a rubber band being snapped on the skin, and usually do not require any type of anesthesia. Each treatment session is customized based on the color, texture and location of the unwanted hair. Much of the hair can be wiped off along with the gel when the procedure is over, and most of the rest falls out on its own within a week or two. Regular activities can be resumed immediately, including going to work, although the skin should be kept out of direct sunlight at first. Many people have second thoughts about their tattoos. Fortunately, you don't have to live with your decision forever. Highly precise lasers can lighten or remove your tattoo by focusing or pulsing light on the ink particles, which then convert the energy to heat and break up into tiny pieces that are absorbed harmlessly by the body. All of this can be accomplished without damaging the surrounding tissue for aesthetically-pleasing results with little to no scarring. During the laser tattoo removal procedure, highly concentrated beams of light are delivered to absorb the ink of the tattoo and fade its color. Different colors of light are absorbed by specific ink colors, so treatment is customized for each individual patient. Most patients report this procedure feeling similar to being snapped with a rubber band, and do not typically require any anesthesia, although local anesthesia is available for those patients who request it. Results can generally be seen within a few weeks, although larger and darker tattoos may require more treatments than smaller, lighter ones. Occasionally treated skin will look paler than the skin around it, but this usually fades in the months following treatment. Not exclusive to teenagers, many young adults, people in their 20's and 30's, have trouble with acne that is hard to control. We know there are many acne treatments out there for you to try and it can be overwhelming. If you have moderate acne and are uncomfortable taking antibiotics or are unhappy with your current topical treatment results, BLU-U® blue light therapy - using light without drugs or antibiotics - may be something for you to try. The BLU-U is a unique blue light treatment that kills acne causing bacteria, overactive oil glands, and premalignant skin cells and precancers. Treatments are simple - you sit with your face close to the light for a short time at a schedule set up by your doctor, approximately a 17-minute session about once or twice per week. The treatments may go on for five weeks or so. It's safe, it's not hot, it's not painful. After some weeks, the blue light can help control your acne. The BLU-U blue light is available at our office. You can ask your provider if your case of moderate acne is right for BLU-U blue light treatment. If you are looking for an alternative to medications or antibiotics, it might be just what you need. Interested in any of these services?